Welcome to the New Beginnings Perinatal Center Website, Dr. Hassan Wehbeh. Dr. Hassan Wehbeh graduated from University of Aleppo Faculty of Medicine and specializes in maternal and fetal medicine, obstetrics and gynecology in Brooklyn, New York. 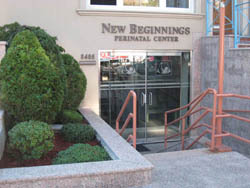 Here, at New Beginnings Perinatal Center, we�ve been trained to provide comprehensive care for the reproductive system in women. Dr. Hassan Wehbeh specializes in treating the wide variety of complications that can arise after birth, ensuring a healthy transition from the womb to the world. We designed the site to accomplish several objectives. First, we wanted to explain who we are, what we do and a little about how we do it. What we expect from you and what you can expect from us. Second, we wanted to provide you a resource for useful information about pregnancy; especially high risk pregnancy. We hope you return to our site as a source of reference in the months and years to come. Third, provide our patients with on-line resource material that will assist in making office visits more efficient and provide a method for giving us feedback on our performance. Fourth, we want to introduce you to our team! Providing care to you is something we take very seriously. Our staff works hard and takes great pride in our State of the Art Ultrasound machines, ongoing continuing education and maintaining expertise in the research and complications of pregnancy. We hope our website meets your needs and would welcome any comments you may have on how we can improve the site to better meet your needs.